At Valley Metal Services, we are experienced metal brokers who buy, sell, and trade scrap steel. Steel is the most recycled material in North America. Scrap metal steel can come from household or industrial appliances, car or truck frames, vehicle parts, siding or roofing, by products from manufacturing (steel turnings), steel cans, air conditioning ductwork, and railroad materials. Our brokers will partner with you and help you get the best possible price for your steel scrap. Plus we make all transportation arrangements. You’ve got the scrap steel, and we’ll handle the sale and the trucking. We make it the whole process smooth and easy! If you are a consumer of scrap steel, we can supply your furnaces with high quality grades. We will provide you with scrap metal steel that will consistently meet your specifications, and any safety and environmental quality requirements you may have for the materials. 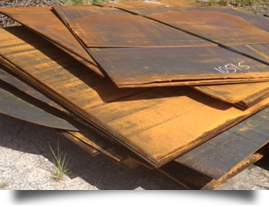 It is our goal to make sure you are delivered the product you need, with the right dimensions, required bulk density, chemistry specifications, and other requirements for your steel scrap. Talk to one of our scrap metal brokers to learn more. Designed by Digital Creations USA, Inc..